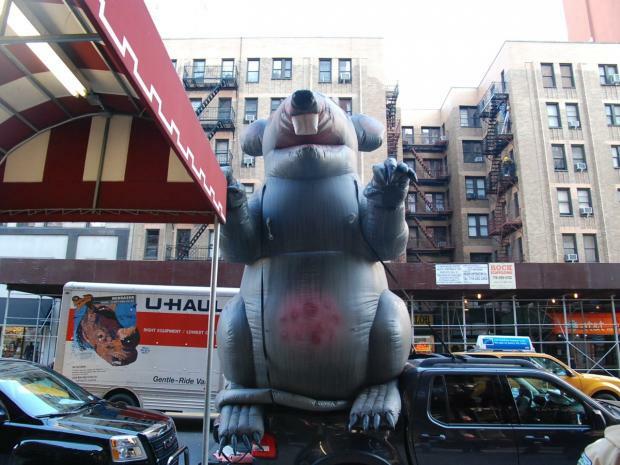 CHELSEA — There are rats in the Hotel Chelsea, according to one labor union — and they're not the kinds with tails. General Building Laborers Local 79 has set up an ongoing rally outside the landmark hotel at 222 W. 23rd St., to protest what its says are unsafe and unfair work conditions for non-unionized contractors working on renovations. Dozens of union workers have been handing out pro-union pamphlets outside the hotel since Monday, complete with a giant inflatable rat often seen in unon protests. "We're not here to take their jobs, we're here to make it safer and organize the workers," said Lenny Anselmo, an organizer for Local 79. "We're here to show support, we're not gonna be pushed around by any other construction company." The union workers are handing out fliers identifying the construction company behind the renovations as Marge N.Y. Inc., which it calls "notorious for exploiting workers." "The result of this is the tenants in the Chelsea Hotel have to live in a dangerous environment," the flyer says. The Hotel Chelsea was bought by developer Joseph Chetrit during the summer and soon stopped accepting guests. Around 80 permanent residents remain as construction goes on around them. On Dec. 2, a tenant's organization filed a lawsuit against the Chetrits, claiming the renovations have been harmful to residents' health. The hotel's owners have already been cited once by the Department of Buildings for unsafe asbestos removal. Last week, Anselmo was one of two union representatives invited into the hotel by tenant Arthur Nash. According to witnesses, several of the non-unionized workers allegedly attacked Nash when they saw him filming with a video camera. Police have launched an investigation into the incident. "The union is there to protect our health and safety, and to inform the public that the workers themselves are being harmed," Nash said. Anselmo said he had been speaking with contractors working on the renovation in an attempt to get them to organize and demand better wages and safer conditions. "We do things safe. We want them to do things safe," he said. "We'll be here as long as it takes." At one point on Wednesday morning, Anselmo got into an extended conversation with a man who identified himself as a foreman for the project, attempting to convince him to organize. "Not gonna happen, man," the foreman said. "Not gonna happen." Calls to Marge N.Y. and to Chetrit were not immediately returned.